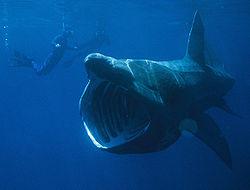 Observation - Basking shark - UK and Ireland. Description: Photo borrowed from wikipedia, identified by it's slate grey colour and dorsal and tail fins. I didn't see the nose poke through the surface altough this is a common id feature. Photo borrowed from wikipedia, identified by it's slate grey colour and dorsal and tail fins. I didn't see the nose poke through the surface altough this is a common id feature.